The Swedish Diet Doc (does he have any patients?) has been on a roll of late, and it's reached a point where I just have to comment. For starters, although it would be impossible for every bariatric doc or even a small minority of them to be real-life examples (in the been there, done that department) to be able to promote what has worked for them, at least one might expect that such a doctor wouldn't hold such disdain for them. When you think about it, medicine is one of those professions where the experts rarely have first-hand knowledge of the fields in which they are often doling out the most personal of advices. But if you don't like "fat people" then why are you making a living off of "treating" them and dissing them behind their backs (and to their faces)? Diet Doc even has a label: Why Americans are Obese. Sounds OK though. Yeah, obese is the technical term. But here is one of the posts on that label: http://www.dietdoctor.com/why-americans-are-fat-part-2. Note that I didn't change the bare URL which belies the original title of the post, and many others, before someone informed the doc that calling people fat might be insulting and not appropriate for a person of his stature to be doing. First of all, the general clientele on a cruise is not reflective of the American population as a whole ... no matter how "fat" we are. But secondly, Andreas was sitting there, on the low carb cruise, snapping pictures of "fat Americans" ... and he would then stand up in front of audiences of devout low carbers that are no less so. What does he think of them? What do they think of that? Eenfeldt's solution to everything is to just eat a LCHF diet. It's the insulin stupid. Don't throw the baby out with the bathwater on Gary's working hypothesis. His blog is a never ending series of short quips when an American gets sick ... as with his "blogging" about Tom Hanks' diabetes diagnosis. If only Tom would just give up the carbs. More on diabetes in a bit. The most important aspect is the food affects the risk of becoming ill or dying prematurely, but most studies are designed to investigate the weight loss for up to a year or two. However, there is evidence that intensive counseling about the Mediterranean diet for obese individuals reduces the risk of stroke, heart attack and cardiovascular mortality, compared with advice on low-fat diets. For other food types, such as low-carbohydrate diet (like Atkins or carb) or diet with low GI, no scientific evidence to determine whether they affect morbidity or mortality in people with obesity. Somehow this update didn't make the blog. - We have to learn that fat is not the enemy and that we ourselves have to change, says Ulf Rosenqvist. At the same time he underscores that there are no studies on how saturated fats affect us long term. - The safest bet so far, is the richer Mediterranean diet with oily fish, nuts and olive oil, where mortality rates are lower than in people who eat a low-fat Mediterranean diet. 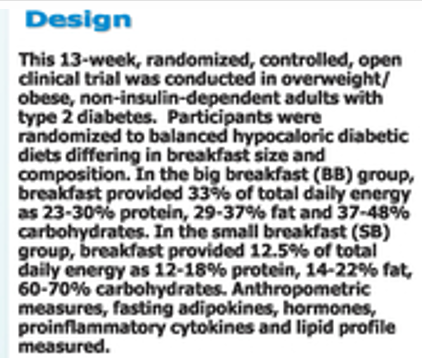 According to a recent study it seems to be good for type 2 diabetics to start the day with eggs and meat for breakfast. A high-carb breakfast produced worse results in many ways. This was an interesting study, that is only available as an abstract here, and you can view the poster here (this is somewhat readable if you C&P into Word and zoom in, but the graphics are not quality enough to read it all). 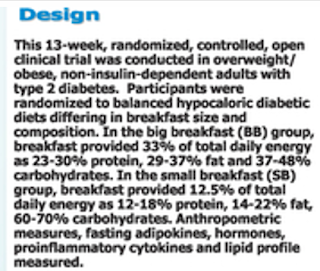 This one made the #paleo hashtag on Twitter aimed at Robb, Jimmy & the Whole9 gang recently as well linking to this report claiming: "Big breakfast rich in protein and fat may be best for diabetes patients". Sounds very LCHF-ey, no? Well. No. There is no indication of whether or not they balance out the macros later in the day, but come on!! The "high carb" breakfast is lower in carb than the big breakfast by almost half. I mean that's what, a slice of toast with a hard boiled egg and a spoon of jam? Or add an extra slice of toast and a schmear of butter for the 2000 cal-ers? I may revisit this study if I can get a better/readable description, but it is hopelessly confounded in that they changed all three macros and calories so the results are of very limited value other than "future studies are needed". But this is an example of Eenfeldt using studies to push his agenda that don't really qualify when you look past the headline. Oh ... and I know English is not his first language, but "produced worse results" could imply it was harmful in some way and all results were either insignificant or improved so he should be careful (as well as calling the SB high carb being woefully misleading). Speaking of headlines, Diet Doc jumped on the publicity stunt bandwagon of Sam "Look Ma Carbs Made Me Grow Taller" Feltham. Most recently Sam gained more weight gorging on a carby junk diet than he did when he shoveled 3000 cal/day extra in nuts. Doc weighs in: Is Overeating Carbs Worse Than Overeating on an LCHF Diet? It's OK to overeat LCHF because you won't have to "pay" for your gluttony. Or is the correct interpretation that overeating LCHF is not to be derided because your body wastes the excesses and you won't gain as much weight. Or is there something just pious about advocating LCHF. Yeah, that's it. Yeah, because all of those metabolic ward studies that demonstrate time and again that a calorie is indeed a calorie are no substitute for free-living studies with questionable accountability, or especially the "real world" example of a skinny dude running fatloss bootcamps where we have only his word that he even did what he claims, and he can't even be bothered to verify what his weight maintaining caloric intake is to begin with. He said this in a post about a new diabetes drug: Low-Carb Diet in a Pill – A Good Idea? I will definitely be blogging about that drug, or more specifically how it fits in with the hyperglycemia in diabetes and treatments, but the post was already appalling before I reached that closing salvo. The drug he was discussing, Forxiga, apparently works quite well -- in conjunction with metformin -- to control blood sugars in diabetics by lowering the threshold for glucosuria. Essentially, by inhibiting reuptake of glucose in the kidneys, subjects lose about 250 cal/day or 70g of glucose in their urine which is one of the mechanisms by which untreated type 1's have difficulty maintaining weight. Over the course of several months there was some weight loss, but more importantly improvements in HbA1c. Again, I'll discuss this, but physiologically this is NOT LC in a pill, that would be acarbose. Acarbose is to LC what orlistat is to LF. Is Eenfeldt really passing judgment on diabetics that might choose to use acarbose to assist them in maintaining blood sugars while enjoying their life? (Heck too much would be unpleasant enough "punishment" for their "sick behavior" anyway. Right? ) But back to Forxiga, this is not like eating LC ... they eat carbs and have the insulin spikes and all that. They simply urinate out some of the excess glucose their livers manufacture. But far be it for diet doc to ever miss an opportunity to pass judgment on diabetics that don't care about their health because they insist on eating carbohydrates. Said carbs that he thinks are making or keeping them fat and diabetic, and without which all would be right in the world. This is his worldview. It appears to be Wheat Belly's too. And so many other low carbers and advocates. I don't know which is worse, those like Andreas that have never known and likely will never know a need to alter their diet to be lean, or the many that are themselves overweight or obese or not all that healthy after all. I suppose it is too much to ask that someone who should be concerned for his patients overall welfare, might actually care for them as a person or consider all the other myriad factors -- both within and outside their control -- that have culminated in their current obesity and/or disease. At least not voice their disdain so publicly even if not always overtly. I don't know ... if for no other reason ... just in case a real life patient happened to stumble across his blog and discover what he really thinks of them. It really makes me sick, and I needed to rant about it. The statement from SBU was published immediately: http://www.kostdoktorn.se/lchf-inte-nodvandigtvis-alltid-bast ... His english site lags behind. Love coming here to get a shot of counter-quack sanity. Participants who ate a larger breakfast -- which included a dessert item such as a piece of chocolate cake or a cookie -- also had significantly lower levels of insulin, glucose, and triglycerides throughout the day, translating into a lower risk of cardiovascular disease, diabetes, hypertension, and high cholesterol. These results, published recently in the journal Obesity, indicate that proper meal timing can make an important contribution towards managing obesity and promoting an overall healthy lifestyle. The study was done in collaboration with Dr. Julio Wainstein of TAU and the Wolfson Medical Center and Dr. Maayan Barnea and Prof. Oren Froy at the Hebrew University of Jerusalem. ate a 200 calorie breakfast, 500 calorie lunch, and 700 calorie dinner. The 700 calorie breakfast and dinner included the same foods. By the end of the study, participants in the "big breakfast" group had lost an average of 17.8 pounds each and three inches off their waist line, compared to a 7.3 pound and 1.4 inch loss for participants in the "big dinner" group. According to Prof. Jakubowicz, those in the big breakfast group were found to have significantly lower levels of the hunger-regulating hormone ghrelin, an indication that they were more satiated and had less desire for snacking later in the day than their counterparts in the big dinner group. glucose levels, leading to high blood pressure and greater strain on the heart. When it comes to diets, cookies and cake are off the menu. Now, in a surprising discovery, researchers from Tel Aviv University have found that dessert, as part of a balanced 600-calorie breakfast that also includes proteins and carbohydrates, can help dieters to lose more weight -- and keep it off in the long run. Halfway through the study, participants in both groups had lost an average of 33 lbs. per person. But in the second half of the study, results differed drastically. The participants in the low-carbohydrate group regained an average of 22 lbs. per person, but participants in the group with a larger breakfast lost another 15 lbs. each. At the end of the 32 weeks, those who had consumed a 600 calorie breakfast had lost an average of 40 lbs. more per person than their peers. breakfast, including dessert, experienced few if any cravings for these foods later in the day." I always appreciate the information that you provide but it's usually about who's wrong. I curious what's right? For weight loss? Any diet that someone can adhere to for the long term that allows for a sustained caloric deficit. In deficit, dietary composition matters quite little unless it is very extreme (I consider the keto craze diets promoted lately, of 70-80 and up percent fat to be extreme, and many see health markers go in the wrong direction despite losing weight). Lastly I believe if we structure our diets around real whole foods, that some "bad" foods here and there are not going to negatively impact health. It's not like radioactivity building up a little bit every time we "sin". Eenfeldt is quote mining Linnaeus as saying that grains are fattening, evidently unaware of the fact that Linnaeus thought human beings were frugivores whose natural foods were raw fruits and vegetables. The Diet Doctor tells people that fruit should be eaten in strict moderation and that berries should be eaten with whipped cream (what?). Got into this mess because portions increased and hence calories. Have Online Doctor Consultation with our expert doctors via e-mail, Skype, by direct call or through your mobile. You can find Specialist&Certified Doctors consultations on online. I also think the record is pretty clear as to the long term success and healthfulness of very low fat diets. This is what most traditional cultures consumed and we're talking fat in the 10-20% range. At total fat intakes below 20 E%, it is difficult to ensure sufficient intake of fat-soluble vitamins and essential fatty acids. A reduction of total fat intake below 25 E% is not generally recommended because very low-fat diets tend to reduce HDL-cholesterol and increase triglyceride concentrations in serum and to impair glucose tolerance, particularly in susceptible individuals. From the 70's the recommended limit of fat intake have gone from 40 > 35 > 30 > 35 > 40 E%. So we are now back where we started. The authority now saying that low fat is "not good for you" is the same that have been promoting low fat for 40 years. So they are biased against fat. Your recommendation of 10-20 E% now contradicts two recent massive reviews by Swedish and Nordic top experts in the field. Reviews of all the science. Time for a reality check? I am speaking of hundreds of thousands of years of human nutritional history here. Last summer I spent some time looking at the literature on traditional diets of various cultures and it is quite shocking to learn just how low in fat most of these diets were ... as I stated, commonly between 10-20% fat. Why doesn't this bear out in clinical trials? Because often the LF arms are not even LF at at all, and mostly employ processed foods and non-fat dairy. I don't recommend that fat intake as I don't think that is sustainable for most living in industrial countries, but those facts are what they are. Meanwhile there are no cultures consuming the type of high fat diet low carb diet espoused and promoted by most paleos and low carbers. Oh the insulin and lectins! While I think you are correct, you actually fall for one of the "paleo-fallacies" this time. Only because for the longest time human nutrition was (probably) prette low in fat that DOESN'T automatically mean this is the healthiest way to eat. Thanks for the update ... if he agrees with the report then why does he continue to insist LCHF is best? Unfortunately I'm carrying "baggage" of recent discussions on FB about this topic and one of the points of discussion was long term healthfulness of a diet. This is where LCHF, as implemented and promoted, has it's biggest hurdle to acceptance. Long term trials aren't going to happen, and, frankly will show differences if they do that are too small to demonstrate anything. We don't have long term trials for other diets either, BUT, we have something better. We have cultures that have been studied where we actually know what they ate and incidence of various diseases, etc. AND, we have the "experiment" of what happens to them when so-called Western foods are introduced into their food supply. I think we're all ultimately left with evidence to weigh. I think the evidence in favor of much lower fat than is considered LF is pretty compelling. Certainly doesn't support the claims that it "doesn't work", "causes obesity", or in the words of Diet Doc should be considered criminal advice by this point (paraphrase, but he has used the term criminal). Do you realize that this is the kind of selfblinding manicheic thinking which is for some reason so typical for the US? I really don't understand it. Don't you realize there is something inbetween LCHF and VLF? There is no prove, not even reasonable hint, that either a LCHF on the one hand or a very low fat diet on the other hand are the healthiest way to eat. If you really want to compare different cultures/diets based on the resulting degree of health and longevity you would most certainly realize that there is actually no really obvious link between the fat or carb content of the diet. Hell, most of the mediterranian people consume a higher relative amount of fat while the Japanese consume only a fraction of the average US consumption. Nevertheless they both have much lower incidence of diabetes, heart desease and so on and reach a higher level of longevity. The report stated that low-carb diets gave more weight loss and small (but significant) improvements in some health markers, during the first six months. After six months, there was no statistical significance between diets. Report said this was likely because of decreased adherence to the diets. Long term, there is still not enough data to suggest one diet is better than the other. So if anything, scientists say, this report concludes that more research is needed. This report was important for two reasons. First, the science supports the idea that LCHF advice is more effective for weight loss, as long as you adhere to the diet. Second, experts could not find any basis for claims about adverse effects on a LCHF diet. I cannot speak for Dr. Eenfeldt, but my guess is that most of his conviction about the effectiveness of this diet comes from seeing results in his own patients, as well as all the success stories he has received over the years. 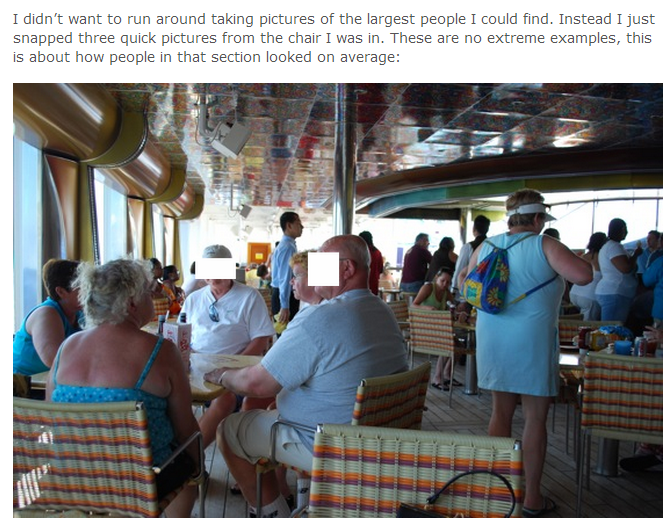 I can't help but notice that in the picture from the cruise, the obese are older people. Even in that picture, the few identifiably younger people are not particularly fat. Average American is obese - that conflates all ages, doesn't it? the legendary diet-heart pioneer J.J Groen covered the Beduins of Southern Israel systematically. The fat intake of the Beduins was traditionally ~11%. 90% calories came from Whole-wheat products. The average Beduin consumed 25 slices of wheat-bread per day, some wheat-porridge during the morning time and not much else. Meat was eaten rarely, fish intake was practically zero. Fruits and vegetables were consumed regularly but in modest amounts. The only animal product consumed regularly was goat milk. Carbs accounted for +78% calories. Wheat-based diets have been traditionally consumed by rural Middle-Eastern people and some Jewish groups. The mean serum cholesterol levels of the Beduins was 155mg/dl (maintained consistently throughout the life), CHD and chronic disease was virtually non-existent, even obesity, even though Beduin women were very inactive, spending most of their time dwelling inside their desert tents. The intake of fat among Okinawa people accounted for 6% of calories in 1950s (see table 1). Carbohydrates 85% calories. The thing about the fat is that many people get the feeling I'm a fat-phobe or low fat advocate per se. If anything I would have loved the literature (of all sorts) to support eating a high fat diet, but it pretty much simply does not seem to be the case ... with olive oil apparently being an exception. And it seems to be more problematic when fat stores are excessive. But just today DD posted yet again using Sam Feltham's nonsense with the headline something about LF making you fatter. Yeah right, almost 150g fat and almost 6000 cals ... that's just like eating a low fat diet normally ... even a 30% fat diet. I'm not saying you have to eat one or the other, I AM saying that there are billions of humans doing the LFHC thing and almost none doing LCHF. We do know the average outcome on LFHC, we do not with LCHF. As for the Mediterranean diet, this may point to the sat fat. Almost to a one, the cultures that have fared poorly when introduced to "Western foods" have added more fat that usually comes along with calories. But the Thai replaced carb with fat and have seen health decline despite a modest decrease in cals (likely activity related). I'm not saying folks need to be LF, but this nonsense that it doesn't work or is even harmful is absurd. LF in most studies is not really much different from the usual diet. That's not what it said -- they presumed the difference may have been due to adherence, but same would go for LF too. PSMFs are better for short term losses, but it's the long term that matters. As to success stories,there are a few, just as there are for many other diets. The clientele on cruises tends to be heavier overall too. We are on average heavier than we used to be, but in some ways it is clearly distorted and as even Fat Head noted in his movie (I think he did anyway), the aging of our population is likely contributing. That's funny .. content seems to be different and depends on what will fly apparently. I guess his Swedish readers were likely to catch wind of the clarification while he's keeping on keeping on with the LCHF is best and only way. Note also how the Mediterranean diet is not driven by ideology or dogma, very few blogs (mostly recipe based ) no regular podcasts, yet this diet is the current gold standard with cardiologists. Truth between two extremes is well and good, but it assumes that both extremes are equally bad and--quite empirically speaking--flawed, which in real world terms, isn't accurate. Two extremes don't have to necessarily be seen just as equally flawed as one can be categorically worse than the other... and even that's contingent on the individual in question. Taking on that logic in itself is, ironically, also very Manicheistic. Population evidence actually leans towards one extreme. Med diets are lowish fat by mainstream practice standards.The often discussed Okinawan diet is even lower (very much VLF even by those extreme vegan standards). The common denominator between both is whole foods to quite a degree. Under such context, this is certainly not the feather-in-the-cap or gold medal moment for the animal-product phobic, VLF vegan movement, but it definitely allows them to take home the bronze and edge out against their HFLC competition in the same regard. On the other hand, carbohydrate restriction has worked out splendidly for many people, but this seems to be a very distinct and small margin of individuals with actual metabolic issues. Yeah, perhaps it's got nothing to do with either macro. Problem is that then we can just pack in the whole discussion. None of it matters or can be criticised or brushed aside, not even HFLC or VLF. With the latest wave of genetic testing that's become such a trend (23andme, etc.) even less of the 'truth in the middle' argument applies as everyone now feels a need to construct a carefully tailored diet to suit their personal profile and risk factors. Keys studied the Southern Italian peasants, and their fat intake accounted for ~20% of calories, which is considered pretty low-fat. The diet was also highly wheat-based. “homemade minesterone….pasta in endless variety…served with tomato sauce and sprinkle of cheese, only occasionally enriched with some bits of meat, or served with a little local seafood…a hearty dish of beans and short lenghts of macaroni…lots of bread never more than a few hours from the oven and never served with any kind of spread; great quantaties of fresh vegatables, a modest portion of meat or fish maybe twice a week…wine of the type we used to call “Dago red”…always fresh fruit for desert”. The Rockefeller institute ran a huge epidemiological research into Crete in 1949. Only 7% of calories came from animal sources (cheese, yogurt), very little fish was consumed. Starch provided theb bulk of the calories. Out of the mediterranian cuisine, I've understood that only the traditional Creten diet was higher in fat. Eastern mediterranians and Southern Italians consumed a diet much lower in fat. Thank you for these citations! 8 a.m. A tumbler of hot water with lemon, sipped slowly. 9 a.m. Breakfast: unsweetened tea or coffee, "two or three Gluten biscuits," and 6 ounces of lean grilled meat. Lunch: 4 ounces of lean meat, 4 ounces of cooked green vegetables without butter, 3 ounces of baked or stewed unsweetened fruit, 1 gluten biscuit, and 1 of the recommended "sugarless" wines. Afternoon cup of tea, coffee, or beef tea without milk or sugar advised. Dinner: clear soup, 4 ounces of fish, 5 ounces of meat, 8 ounces of vegetables, and 4 ounces of stewed fruit. Plain salad and 2 gluten biscuits, if desired. A list of vegetables and condiments were recommended for variation. Taft dropped from 314 pounds in December 1905 to 255 pounds in April 1906 during the first course of treatment. His weight-loss plan "seems quite similar to what we would call a low-carb diet, but people didn't even talk about carbs at that time," Levine says. The diet was roughly 2,000 to 2,100 calories a day with about 30% of the calories coming from carbohydrates; 30% from protein and about 40% from fat, says Catherine Champagne, professor of dietary assessment at the Pennington Biomedical Research Center in Baton Rouge. She wasn't involved in writing this article but did a nutrient analysis of the diet for USA TODAY. IMHO - This ISN'T a low carb diet! Also - In fact, by the time, Taft was inaugurated as president in 1909, his weight was much higher (354 pounds) than his starting weight on the diet (314 pounds), Levine says. She says she doesn't know what eating habits led to the weight regain. "Last summer I spent some time looking at the literature on traditional diets of various cultures and it is quite shocking to learn just how low in fat most of these diets were ... as I stated, commonly between 10-20% fat. " would you still have some of your notes on this? Very interesting! So interesting! I'm sure you've discussed this before here - what categories did you file this under? Or do you have links to these posts? I have notes on my other computer and was going to do more studies, but ran out of time and interest. While it is interesting to study such things for some, it's really not my general area of interest ... that lies more in the metabolic science. But I'm struck by the misrepresentations of the pacific islander and Pima diets. The Aussie aboriginal diet differed shoreline to inland, but neither were high fat, and what fat was mostly PUFA in the shoreline case. Over and over I became struck with the low fat AND protein content. Thing is these people tend to be a lot smaller. I'll look for that link later this evening. Perhaps if I get time I can compile links to all of the papers. Notice how much smaller the Hadza are. This is really interesting, thank you so much. I agree with your earlier comment that the "hundreds of thousands of years of human nutritional history" can be indicative for what type of diet we are probably tolerating quite well. Unfortunately, it seems like in many discussions of the subject, authors present data with a specific bias and it is very difficult to get a full picture of objective data points. Keys observations are valid to a degree, but he had a strong bias against animal foods and fats. Weston Price's observations are valid to a degree but he developed a bias towards all industrialized foods and sugars. Cordain's observations are also valid to a degree, but he presents it under a bias agains all neolithic foods that have been introduced since the dawn of agriculture. Eades presents results from Kratzenburg's isotope tracer studies of early hominids who demonstrated high meat consumption throughout extended periods of evolution. These are valid to a degree, but he presents them with a bias against the vegetarian claim that we are not supposed to eat meat, etc… All of these reveal parts of the puzzle, but need to be put in context. We are all victims to confirmation bias, unfortunately, this means it is really difficult to get an objective assessment of what the available body of knowledge about these hundreds of thousands of years of human nutritional history really is. My guess: whatever was seasonally available in natural and cooked form, prioritized by what tastes best (which likely correlates strongly with energy density). So when fatty animal foods were available, you would have probably given preference to those. When not, you would have gathered what was available. You had seasonal variation, so would consume more during certain periods and less during others. Animals were fatter during summer, very lean during winter. You would probably build food reserves in fall to get through longer periods of lower food availability during winter. Storability of fattier foods and some starchy foods makes them great reserves. Other foods were fermented or otherwise prepared to last over a longer winter. And you had some fortunate regions in which pretty much all plant and animal foods were available in similar ways throughout the entire year due to climate. In the end, it probably resulted in humans consuming a broad variety of plant and animal foods, while isolated periods of "extremes" over the yearly cycle were not uncommon. During such periods, diet was possibly based on only few limited foods or macronutrients. But as soon as a broader variety became available, variety increased with availability. As societies emerged, the economic element (rich/poor) also influenced availability of foods. Cultural aspects will have strongly influenced food preferences (religion, etc.). Based on all this, it's difficult to understand how/why we would have developed an inherent intolerance to one specific macronutrient. We evolved to tolerate a great variety of plant and animal foods, the keyword being variety - which is based on availability. It is probably reasonable to assume we have no inherent intolerance for a specific macronutrient in the context of a diet based on broad variations of natural plant and animal foods. Isolated extreme periods are unlikely to do much harm. Chronic extremes, however, may be a different story. Interesting to ponder over… Love to read any data/links you find. My New Years resolution next year is to never read another food blog on any side of the diet/health argument (discussion?) I think I'll just kind of eat a broad assortment of rea natural food. I am a type 2 diabetic and have lost interest in blowing in the wind between diet ideas or picking one to the point of it becoming a religion. I think a lot of these sites mean nothing but the best for their raders with secondary hopes of fame/income as well. How am is uploaded to take a site seriously that has a link to join a "Real "Food Convention" on the same site that tells me to eat an ice cream bar from a sponsor followed by a donate button. You know what? I can't. This site appears much less capitalistic but still seems a bit too evangelistic for me. Again, just for me. Anyway......for some reason, today, I just really just feltlikesaying this out loud in print. With EasyHits4U you can earn free advertising credits by viewing other website-ads from a member base of over 1,200,000 accounts. Earn credits fast with a 1:1 Exchange Ratio.